Two obscure and delightful sides featuring the mournful voice of Noel Tempo, aka Noel Bailey, aka Sowell Radics. Though better known as a guitarist, especially once he made innovative use of a wah-wah pedal in the Roots Radics band, Bailey got his start in the late 1960s as an aspiring vocalist, singing the Tony Scott-produced ode, ‘What Am I To Do,’ which would soon morph into ‘The Liquidator.’ He also recorded the odd track with Roy Shirley in the producer’s chair, and played in various hotel bands, including the Youth Professionals, the Rotations, Happiness Unlimited, and Solid Foundation, before being drafted into Jimmy Cliff’s Jamaican Experience band (along with longstanding keyboard spar, Pablove Black). 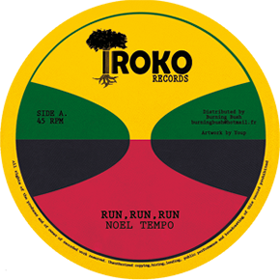 ‘Run Run Run,’ which castigates a heartbreaking ex-girlfriend, is another super-rare outing, issued in minute quantity circa 1975, and dates from his time with the Rotations band, as evidenced by its original seven-inch issue on the Rotations Records label. B-side ‘It’s Time To Be Free’ was issued on Rupie Edwards’ Success label in 1976, and has Bailey at his most emotive, imploring everyone to help their fellow man, especially in times of distress; the fabulous harmonies, courtesy of the Heptones, were arranged by Leroy Sibbles, and the track’s sparse dub version places emphasis on its chilling piano and organ line, plus the non-standard use of percussion. Recorded between Randy’s and Dynamics, according to Bailey.